The essential components of your training program are described below. We emphasize flexibility in the design of your Program of Study and encourage you to take full advantage of our multidisciplinary training environment. The Graduate Committee will assist you in your initial course selections and research rotation choices. You will have a guidance interview with the Graduate Committee to learn about the program in Biochemistry and choose courses for the first semester. A poster session will be held to allow you the opportunity to interact with each faculty member and/or members of their labs to find out about their research and get an overview of the active research areas in Biochemistry. This will help you think about choosing a research advisor and Supervisory Committee. 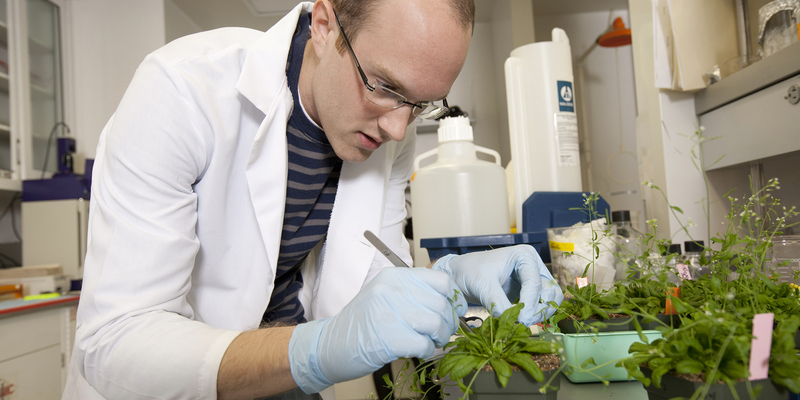 The major component of your graduate degree is a thesis that describes original research you conduct in the lab of a faculty advisor you select. Students typically choose an advisor based on a shared research interest and/or a good rapport with that faculty member. Many students entering the graduate program will have limited experience upon which to base this important career decision. We recommend that you do at least two “rotations” (i.e. ; work in a lab for a short time on a trial basis) in your first semester. The program is set up to allow you to rotate for two eight-week sessions during the semester (a third rotation may also be done during the summer before classes start or in the second semester). You will choose your first rotation after interviewing faculty whose research attracted you during the poster presentations, and make your second choice at the end of the first four weeks when you have had an opportunity to acclimate. After the second rotation, all students will submit their choices for an advisor to the Graduate Committee, and final assignments will be made. Sometime in your second semester, you will confer with your research mentor to form a Supervisory Committee. The purpose of this committee is to evaluate your progress in the degree program, to offer a support network within the University of Nebraska-Lincoln, and to assist you with practical guidance in your research project. Your committee is chaired by your research advisor and must consist additionally of three other Biochemistry faculty members and one faculty member from outside the Department. Each year, you will schedule a meeting with your Supervisory Committee. At the meeting, you will present a 20-30-minute talk about your research progress to date, and your goals for the coming year. The Committee will question you during your presentation to ascertain your level of development as a scientist, and will advise the Graduate Program Committee whether you are making satisfactory progress toward the degree objective. If progress is deemed insufficient, it is also the responsibility of the Supervisory Committee to forward recommendations for improvement, probation or termination where warranted. All students in the Ph.D. program are required to take biochemistry seminar (BIOC 992k) each semester for a total of at least 8 credits. Each student will present two seminars per year, one of which is based on a current journal article of broad interest and the other a formal presentation of their laboratory research. Other course requirements are arranged in consultation with the Supervisory Committee. The student and advisor submit a Program of Studies that details the student’s course work requirements to the Graduate College before one half of the courses are complete. Successful completion of the Ph.D. degree involves 90 credit hours in which a third is coursework and the remainder thesis research. No more than 55 credit hours may be earned in dissertation research, and 35 credit hours must be in Biochemistry offerings. The Graduate Committee has prepared a TABLE that outlines the graduate program requirements by semester. For convenience, this table also lists some sample specialty courses that can be chosen by students in consultation with their faculty mentor and supervisory committee. Questions can be addressed to the Graduate Committee Chair. Students in their fifth semester must pass a Comprehensive Examination consisting of written and oral components. The exact nature of this Exam is determined by the Supervisory Committee. Typically, you are asked to write a research proposal in the style of an external grant application on a topic of your choosing. The topic must be different from your advisor’s and your own research area. You then schedule a meeting with your Supervisory Committee at which you will give a presentation of your proposal and defend against the Committee’s questions. We ask that you circulate the proposal to the members of your committee approximately two weeks before the meeting. The exam will probe the depth and breadth of your biochemistry knowledge, and the sophistication of your scientific thought process. Passing the Comprehensive Examination results in your being recommended for Ph.D. candidacy. You must be admitted to candidacy at least 7 months prior to your final oral dissertation defense. Also, the Graduate College has a rule that if a student does not graduate within three years of passing the Comprehensive Examination, the Supervisory Committee must give another such exam. The development of oral communication skills is an essential component of professional development. Students give regular presentations in laboratory meetings, journal clubs, and other informal settings. The required credit hours in seminar courses (BIOC 992k) are expected to give the student experience in formal presentations. All Ph.D. students are required to give a formal, research-based, publicized seminar related to their dissertation research. In addition to giving seminars, it is equally important for students to educate themselves by attending seminars. External speakers are regularly invited in to several seminar series and annual symposia that we urge our students to attend. In particular, you should attend the weekly Biochemistry Departmental Seminar, at which eminent speakers of international renown present their research at the invitation of our own faculty. Learning to communicate effectively in a teaching capacity is also critical to your future career as a scientist. To facilitate this aspect of your development, you will be required to teach biochemistry laboratory courses for 2 semesters; additional teaching experiences in the undergraduate program are also available for those who are interested in pursuing careers in biochemistry education. International students must attend and pass a three-week intensive training session (ITA training) in the summer after their first year to prepare for their teaching assignments. Information can be found online. Average time to completion of a Ph.D. is a little over 5 years. How does that break down in milestones for students? Second semester: selection and first meeting of supervisory committee; select coursework for second year of study. Second semester: second meeting of supervisory committee; select format / topic for written and oral comprehensive exams.